Lyndex-Nikken's has introduced the 5AX-2MT Multiple Spindle Rotary Tilt Table which is designed for high production applications. According to Lyndex-Nikken, rotational speed of the 5AX-2MT is 22.2 rpm, with a tilting rotational speed of 11.1 rpm. Both the rotary and the tilting axes can be controlled by either the machine's CNC control or via independent controllers. Lyndex-Nikken claims the 5AX-2MT features a table size of 105 mm diameter. The maximum workload on the table is 15 kg per spindle. A powerful braking system is included producing 147 Nm clamping torque. Lyndex-Nikken offers a variety of options for the 5AX-2MT to meet workholding, fixturing and chucking requirements. 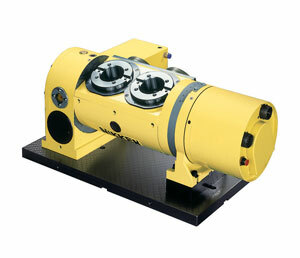 Supplied by Lyndex-Nikken, Nikken rotary tables are designed with a patented carbide worm system. The carbide worm system incorporates a carbide worm screw and an ion nitrided worm wheel, rather than a conventional bronze or bronze alloy actuation mechanism. The result is a reduction in friction and wear by up to eight times. The worm screw consists of a less brittle V-grade form of carbide, while the worm gear is ion nitrided to a depth of 0.1 mm and an external surface hardness of 68 Rc. These properties, as well as a steel way hardened to 58-60 Rc, all work to enhance system rigidity and longevity, and high-speed, high-accuracy rotation.